Individuals are able to soar solo or team up with their friends, carers or family and those with the disability are the ‘Superheroes’ while the other individuals are ‘Sidekicks.’ There’s no need to prove your disability but just self classify as having a disability. Sign up, rock up and rock out. With such a disability-friendly and focused theme, everything is thought about. From parking facilities to changing areas and fully accessible toilets, the village has a great environment full of wintery cheer and festive spirit. Registration was super smooth and superheroes lined up to receive their t-shirts, prior to participating. First of all, the ‘Speedy Wave’ went off for those completing a 10km in under 35 minutes (WOW)! Shortly after the first wave, the rest of us were sent through and separated into two sections - those on feet/blades and those using faster means of travel (or just really fast runners). Those who were slower were encouraged to use the inner circuit while those speedier individuals were marshalled to the outer ring. As I was looking to complete the 10km course in under an hour, I decided to take the inner ring but I swiftly moved to the outer when I encountered a bit of a runner’s traffic jam. Marshalls were, as always, awesome! Well placed throughout the event and with big hearts, they were great at encouraging others and offering high-fives for everyone. I had the opportunity to run for Blatchford, the prosthetics company for my Blade XT. As a disability event, I also put the feelers out to see if any of my adaptive buddies would like to take part - my best buddy Alex took up the opportunity. As well as looking for other adaptive participants, I was also looking for some sidekicks to take part - after a quick social media post, Lotta, another ASICS Frontrunner snapped up the chance. 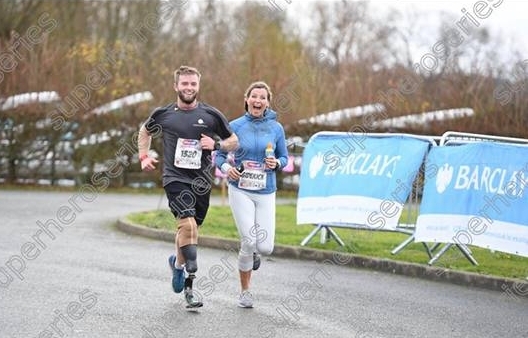 We decided between us that she was going to assist in helping me to achieve a new 10km PB while her partner was going to assist with Alex and his sidekick. Not Just One But Two PBs! I never set to break a 5k PB however I was determined to break the hour 10km. As I had never raced a 10km event without obstacles, I knew it was very possible so I set myself a simple target of under an hour. Adrenaline was running through me as I embraced the event and I ran off with Lotta at a pace that was simply too fast for my little legs to keep up. After a few kilometres at the faster pace, we decided to cut back in order to save some energy. Lotta didn’t need to worry about saving her energy - she was incredible at cheering other runners and was certainly full of beans. After a few adjustments to my leg on the go, I managed to come in from my first lap in 26:48, achieving a new 5k PB (with a lot more to give) and my second lap saw me coming in at 55:02, 5 minutes under my previous personal best. As the course wasn’t quite 10km, we ended up adding in a few laps so my map was a little bit odd by the end. I was pacing the run for a certain target and I know that the future certainly looks bright with faster and stronger times. I had a lot more to give and it’s great to know that I will be pushing that more in the future. The whole event was such a fantastic show of what people are able to do, instead of being labelled with their disability. Everyone involved seemed to be having a great time and with Christmas choirs present and Father Christmas present, the season is now upon us! Oh….the medals are also awesome! When I first walked into the area I saw wheelchairs, bikes with extra wheels, blades instead of legs, and so on. I was introduced to some participants and immediately started socialising. We talked about the route, finishing times we were hoping for, and possible previous experiences at similar events. I wasn't sure how much people wanted to talk about their disabilities so I decided to stick to the above mentioned topics. Then we ran/wheeled the course. I ran with Jamie. It is amazing how open he is with everything related to his stump, and how positive he is as a person. We stopped a few times along the route to adjust his leg - added a sock or emptied the pool of sweat gathered in the socket. It was all normal, I had run with Jamie several times before and completely trusted he knew what he was doing. It was wonderful to see people completing the distance on their own but it in another way it was nice to see a group of people doing it together, almost like in a team. It only struck me on the way home, that a strange thing had happened to me during the course: After the run when we all talked about how it had felt to cover the distance, how windy it had been etc. not even once did I think about some of us being disabled. We all were runners/wheelers, and talked about the race just like after any other race … and maybe even tried to blame the weather or route if we hadn't reached the aimed target time. Sure I realised that for example Alex' arms must have been tired (wheelchair) but it was more like a race-related issue than a disability issue. My thinking had shifted. All in all I loved seeing all these smiley people out there enjoying the loop/s, there was so much energy and positive vibes. Organisers, marshals and cheering squads and also the medals were all fantastic.